Jim Messina’s legendary career spans five decades, three acclaimed rock super groups, a solo career and a dizzying array of producing and engineering credits. He is an indisputable expert in the fine art of making hit music. Starting out as producer and recording engineer for Buffalo Springfield, Messina later joined the band as bassist. 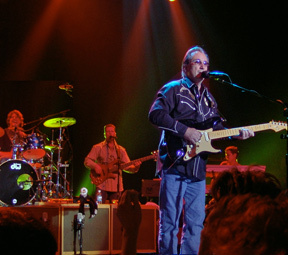 After Buffalo Springfield split up in 1968, Messina’s friendship with group founder Richie Furay led to the creation of Poco. Jim switched to playing lead guitar and the band went on to define a new musical genre that came to be known as country­-rock. After two studio and one live album with Poco, Messina left the group to devote his time to record producing. That fateful decision led to his 1971 collaboration with newcomer Kenny Loggins. The resulting duo, Loggins and Messina, went on to record nine albums over a period of seven years, amassing sixteen million in sales. During the 1980s, Messina released three solo albums, as well as recording and touring with the original Poco for its 1989 reunion album Legacy, and two highly successful reunion tours for Loggins and Messina in 2005 and 2009. Solo acoustic performance dates by Jim were well-received and led to his forming a new band to tour with and do the best of his own material and as well as that of some of the illustrious company he'd kept over the years. With an album of all-new material on River North, Jim says he's enjoying discovering who he is, where he's been and where he's going – all worthy destinations to be revered and celebrated.